After going 3-for-3 Lucas Divino won his first event of the 2018 season. Photo by Andre Silva, BullStockMedia.com. 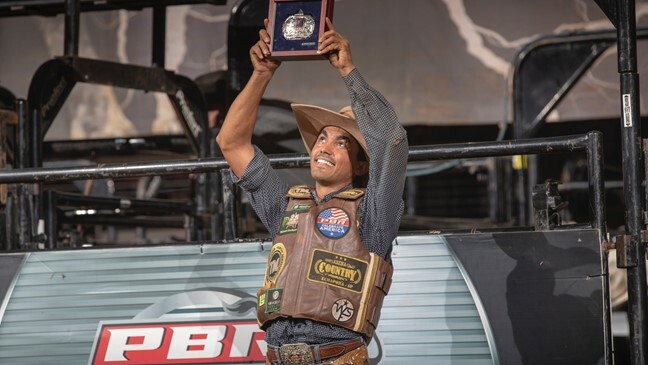 PORTLAND, Maine – Lucas Divino (Nova Crixas Goias, Brazil) earned his first win of the 2018 PBR (Professional Bull Riders) Real Time Pain Relief Velocity Tour (RVT) season, winning the Portland Chute Out in Portland, Maine at the Cross Insurance Arena. The 24-year-old was the only rider to go 3-for-3 as he rode YoYo (Rocking M) in Round Two before conquering Gubber (Mike Miller Bucking Bulls) in the championship round to earn 120 points towards the world standings along with $6,900. The first career win on the league’s expansion tour also earned Divino an invite to 25th PBR: Unleash The Beast, Winstar World Casino & Resort Invitational at the Frank Erwin Center in Austin Texas on September 28-29. Second place went to Eli Miller (Statesville, North Carolina). The event was Miller’s to win as he held the lead going into the championship round thanks to his ride on One Cool Dude (Mike Miller Bucking Bulls) for 87.5 points. Buckshot (Cornwell Bucking Bulls) proved too much for the young gun as he was dispatched in 2.8 seconds. Miller earned 70 points towards the world standings along with $5,000. Currently he’s the No. 4 rider in the RVT standings and is 55th in the PBR world standings. Michael Lane (Tazewell, Virginia), continues to hold the lead in the RVT standings thanks to his third-place finish on Saturday night in Portland. He covered Hair Trigger (85 points) in round two but was tossed to the ground in 1.92 seconds in the championship round by Movin’ On Up (J Bar W). Lane, who’s ranked 44th in the world earned 40 world points and a paycheck of $2,900. Fourth place went to Brazilian Paulo Lima (Bezerros, Brazil) who covered Slim Ice (Cooper Bucking Bulls) for 82.5 points. He earned 20 points towards the PBR world standings and $1,800. Texan Ezekiel Mitchell (Baytown, Texas) finished in the money in fifth place. He rode Archie (Cooper Bucking Bulls) for 87.5 points earning 15 world points for a payday of$1,540. Cooper Bucking Bulls Hombre and Cornwell Bucking Bulls/Circle G’s Mud Duck were named the Portland Chute Out bulls of the event with equal 44.50-point bull scores. Hombre tossed Australian Lachlan Slade (Queensland) in 1.79 seconds while Mitchell got on Mud Duck in the championship round and was bucked off in 3.04 seconds. The Time Pain Relief Velocity Tour will next be in action on September 22 in Rochester, New York with the Rochester Rumble. 1. Lucas Divino, 79.5-80.5-83-243.00-120 Points. 2. Eli Miller, 86-87.5-0-173.50-70 Points. 3. Michael Lane, 84-85-0-169.00-40 Points. 4. Paulo Ferreira Lima, 83.5-82.5-0-166.00-20 Points. 5. Ezekiel Mitchell, 0-87.5-0-87.50-15 Points. 6. Andrew Alvidrez, 84.5-0-0-84.50-10 Points. 7. Kyle Jones, 0-82-0-82.00-5 Points.